Part of Mother Earth, crystals and gemstones are intimate pieces of the body of the Goddess, sacred tools that can help us tap into Her energy for healing, magick, and spiritual growth. In this practical guide to working with the stones of the Goddess, Nicholas Pearson explores more than 100 gemstones and crystals strongly connected with the energies of the Divine Feminine, including old favorites like amazonite, amethyst, geodes, and carnelian (also known as the blood of Isis), alongside newer and more unusual stones such as sakura ishi, yeh ming zhu, and Lemurian seed crystals. He details each stone’s spiritual and healing properties, astrological and elemental correspondences, Goddess archetypes and lore, magickal uses, and the aspects of the Divine Feminine it embodies. Providing an overview of major Goddesses from around the world, he reveals how Goddess traditions and myths have incorporated stones throughout history. Guiding you through the basics of crystal work, including cleansing and programming, the author offers step-by-step instructions for Goddess-centered magickal rituals, guided meditations to connect with the Divine Feminine, and the use of crystals for spellcasting. He explains how to create crystal grids, including the Triple Goddess Grid and the Venus Grid; crystal elixirs, such as Aphrodite Elixir and Yemayá Essence; and crystal charm bags for purification, wealth, and a happy home. With the rebirth of the Goddess now happening after millennia of suppression, Pearson shows how, by working with gemstones and crystals, you can help restore the radiant light and limitless magick of the Divine Feminine and move humanity toward collective growth and healing. The stones of the Goddess are here to support us through practical means as well as serve as anchors for the return of the Goddess’s presence. Nicholas Pearson has been immersed in all aspects of the mineral kingdom for more than 20 years. He began teaching crystal workshops in high school, later studying mineral science at Stetson University while pursuing a degree in music. He worked for several years at the Gillespie Museum, home to the largest mineral collection in the southern United States. A certified teacher and practitioner of Usui Reiki Ryoho, he teaches crystal and Reiki classes throughout the United States. He lives in Orlando, Florida. 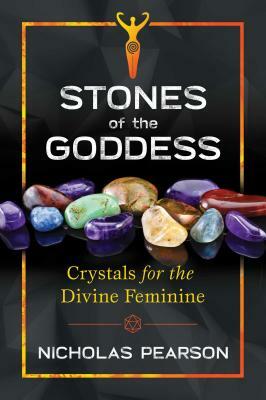 "In this book, he introduces readers to the Goddess while, at the same time, giving them practical information for creating a crystal toolbox for working with stones."